Sometime back in 2013, I remember sitting at my desk working, but my mind kept wandering…. I couldn’t stop wondering what those 3 big letters stood for….G-M-O. Every so often I’d come across an email for my boss that mentioned GMO’s, and now our company was selling a feed product that stated NON-GMO right at the top of the bag. So the next chance I had, as my boss walked thru our office, I stopped him and asked, “What does GMO stand for?” He responded with, “GMO stands for genetically modified organisms”, and then he walked out. “GMO is a what?”, I thought. He gave me an answer, but I still wasn’t quite sure I understood what that meant. Why did the product we sell claim to have no GMO’s? Were they bad? What was the big deal? As I discovered the truth behind GMO’s, and that they were not only in some animal food, but also in the food we buy, I was greatly bothered. This led me to NEED to learn even more…So I hit the documentaries! It was kinda gross to watch at times, but boy did it open my eyes and was definitely more than I was expecting. I will never look at food the same way again! 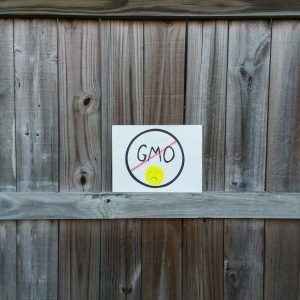 Next blog -> GMOs – Are They Safe?